Learning can be a fraught proposition at any age. It involves engaging new experiences, facing fears, risk-taking, and effortful exploration. Every effort comes with opportunity costs, and only some efforts are fruitful. Those who aim for expertise and innovation have an even harder road: they have to learn their discipline and peripheral ones well, and they have to compete globally with new ideas, new methods, and new paradigms. To succeed, babies and toddlers need proper care for healthy functioning, and they need to have their learning needs met at the respective developmental windows (or risk experiencing unbridgeable gaps in capabilities and performance). People often need to be self-aware as learners. They have to be able to control their impulses and direct their attentions and energy and resources to learning effectively—encoding relevant information into long-term memory. They have to be able to set proper learning goals and follow through on them, even in the face of boredom or hardship or other challenges. When they solve problems, they have to be able to bring the relevant information to their working memory, analyze it effectively, and process solutions creatively and critically. They have to be able to store complex knowledge without being ruled by its pre-existing patterns. This must all be achieved with the inexorable pressures of time. Self-regulated learning is a cross-curricular cross-disciplinary competency. Jill E. Stefaniak’s Self-Regulated Learners: Strategies, Performance, and Individual Differences (2018) features a collection of research works focused on learners in early childhood education through higher education to capture some of the best practices for inculcating the knowledge and skills for self-regulated learning (SRL). Michelle A. Gnoleba, Anastasia Kitsantas, and Suzanne E. Hiller’s “Exploring Faculty-Student Interactions, Academic Self-Efficacy, Perceived Responsibility, and Academic Achievement of College Students” (Ch. 1) highlights the importance of the faculty-student relationship for college students. Based on survey research involving 216 undergraduate students at George Mason University in Virginia, the authoring team found “positive relationships between faculty-student interactions, academic self-efficacy, perceived responsibility, and GPA” (Gnoleba, Kitsants, & Hiller, 2018, p. 2), which aligns with prior research. More concerning, they found disparities in the perception of faculty support based on racial/ethnic groupings. The research team found a sense of “higher perceptions of faculty caring and career guidance” among White students as compared to Hispanic ones (p. 2). Further, they found that White students reported “higher levels of academic self-efficacy and perceived responsibility compared to Asian students, and lower perceptions of negative experiences with faculty than Asian and African-American students” (p. 2). Could these differing learner-described experiences be a partial explanation for the achievement gap among learners of different racial/ethnic groups? The authors observe that while there are falling high school dropout rates, performance gaps have persisted in higher education. They write, “Most recently, a research study sponsored by the National Clearinghouse Research Center (Shapiro et al., 2017) concluded that African-Americans have the lowest completion rate of four-year college programs at 45.9%,, (sic) with Hispanic students performing at 55% completion” (Gnoleba, Kitsants, & Hiller, 2018, p. 2). The authors suggest the importance of available faculty members who provide frequent supportive and caring contacts with learners. Both formal and informal interactions with faculty are seen as important, with informal interactions including those that “occur outside of the traditional classroom setting such as office visits and online discussions” (p. 4). They point out the importance of setting high expectations for all learners. They provide ideas for integrating time management skills, effective help-seeking, meta-cognitive monitoring, and persistence in the learning experiences. In creating the learning environment, instructors are helping build the whole student. The authors offer some practical suggestions to encourage more constructive faculty-student interactions, including mentoring ones. The sample size was fairly small, and the respective racial/ethnic group sizes vary a fair amount. The gender count was not particularly balanced. However, even with the limits, the issues brought up are socially relevant and practical. Laura Dörrenbächer and Franziska Perels’ “Measuring Self-Regulation in Preschoolers: Validation of Two Observational Instruments” (Ch. 2) focuses on preschool as “the first phase of curricular education” p. 31). This work aligns with the “pipeline” approach of human development, which considers every phase of the human lifespan as important to the development of the whole person. The researchers build on prior research that shows some self-regulated learning capabilities of preschoolers by building and testing two instruments related to the preschooler age group. These instruments are designed for use by kindergarten teachers to assess the learners’ ability to self-regulate their learning and as a foundation for building interventions to support young learners’ development in SRL. This research involves 44 children aged 5 – 6 years old as research participants in “a test-theoretical assessment of two observational instruments to measure self-regulated learning in preschoolers online while working on a problem-solving task” and both instruments assessing “cognitive/metacognitive and motivational strategies” (Dörrenbächer & Perels, 2018, p. 32). The researchers based their instruments on prior research of others, including the self-regulated learning process model, involving forethought, performance, reflection after the performance, in a cyclical process (Zimmerman & Cleary, 2006, as cited in Dörrenbächer & Perels, 2018, p. 33). One version of this model is portrayed in Figure 1. [The three phases have also been described as the following: forethought, volitional control/performance control, and self-reflection.] Self-regulation helps children “in controlling the behavioral domains of emotion, cognition, motivation, and prosocial behavior” [Bronson (2000), as cited in Dörrenbächer & Perels, 2018, p. 36]. Bronson’s theory of self-regulation in preschoolers (2000) also serves as another basis for the research. The chapter Appendix provides a closer view of the self-regulatory strategies in the observational method for SRL strategies along the three phases in Zimmerman’s SRL process approach (pp. 63 – 65). This contribution looks to be a powerful one to advance the field of SRL to preschoolers in actionable ways. The researchers are from Saarland University in Germany. Lisa Hayes, Suzanne E. Hiller, and Anastasia Kitsantas’s “Science e-Newsletters: A Platform for Home-School Connections in Fostering Self-Regulated Learning in Elementary Students” (Ch. 3) points to a simple (low-tech) electronic resource to promote SRL in elementary-age home-schooled students. This research is comprised of content analysis of weekly science-based e-Newsletters used by an expert teacher in a science classroom and the identification of self-regulated learning elements within them, “including environmental structuring, goal setting, self-monitoring and self-evaluation” (Hayes, Hiller, & Kitsantas, 2018, p. 67). As such, electronic newsletters are seen as an important tool to connect the learners, teachers, and learners’ parents in the homeschooling context and to link science learning to more “authentic science experiences” (p. 77) and citizen science endeavors. This chapter promotes the conceptualization of electronic newsletters as “viable platforms for supporting parents and students to become proactive, self-responsible learners in science education” (Hayes, Hiller, & Kitsantas, 2018, p. 69). The SRL advances the work of both home-schooling parents and the learners: “More than enhancing cognitive gains and self-regulation, e-Newsletters provide a medium for involved parents and children to practice planning, acting, and reflecting based on school experiences” (p. 76). The authors provide some direct examples of contents from the e-newsletters which showcase the SRL elements. They also provide some tips on how to create these science-based e-newsletters and to include more reflective practice in the science studies. Executing functioning (EF), based in the frontal lobe and prefrontal cortex of the human brain, is considered an important part of self-control and purposeful action. Students with disabilities who have limited EF are at a special disadvantage when they are studying science because of the complex demands of conducting multipart experiments or reasoning in complex system-based ways. Janice Bell Underwood’s “The Influence of Executive Functioning and Self-Regulation on Science Learning for Students with Disabilities” (Ch. 4) takes on this challenge of how to meet the needs of learners with EF deficits. What are some of the challenges for learners with “learning, social, and emotional disabilities” (p. 99)? Those with poor executive functioning skills may require “assistance with various interventions to support their abilities in self-control, flexible problem-solving, and sustained engagement” (Underwood, 2018, p. 99). This researcher suggests that there is a lack of instructor preparedness to deal with learners with cognitive disabilities in science learning and insufficient skills to set up inquiry-based instruction with the necessary learner supports. This is especially so given the trend of lessening financial supports for education and high demands on over-stretched staff. There are risks of presenting science learning in inaccessible ways to students with EF deficits and insufficient prior content knowledge for meaningful learning. The gold standard of science learning goes as follows: “The gold standard in science teaching is facilitating unguided inquiry, where students are encouraged to develop and pursue original questions for their investigations” (p. 104). Underwood offers a number of suggestions of how to help learners with EF deficits to focus on important parts of an experiment through directed questions, focuses on terminology (like independent variables, dependent variables, hypotheses, and others), and drawing pictures of their observations. She focuses on the fundamentals of science, to help learners understand methods as central to building the “intricate and interconnected set of competencies” required for effective science learning (Underwood, 2018, p. 100). Transitioning to Higher Education by Acquiring Catch-up SRL Skills? To achieve improved self-monitoring for learning, Giblin points to the uses of learning diaries, measurement scaffolds, analysis of feedback, task calendars, and work plans. She shares practical tips for college instructors, such as: “Construct opportunities for directed reflection on learning processes embedded in the learning process. Consider using a learning diary, emailed prompts, or weekly class discussion time to achieve this goal.” (Giblin, 2018, p. 134) She suggests three core principles for college teachers, to “make the learning process overt…provide models with explanations…(and) encourage a mastery approach” (Giblin, 2018, pp. 143 - 146). Typically, students relied on the frequent class meetings, addressed questions to the teacher, or utilized the provided text book to seek assistance. In college, these supports are lessened, classes meet less frequently, the textbook is not provided and instructors may deviate from the assigned text (Giblin, 2018, p. 135). This chapter offers a learner-centered approach to developing self-regulated learning skills in freshman students. The well-reasoned ideas generalize well to instructors across a range of disciplines. A survey study of 330 university students at Tomas Bata University in Zlín, Czech Republic, is the basis for a structural equation modeling analysis of the “relationships among self-efficacy, self-improvement…and metacognitive regulation” in Jakub Hladik and Karla Hribackova’s “The Role of Self-Efficacy and Self-Improvement in Metacognitive Regulation in Students of Helping Professions” (Ch. 6) (p. 155). In this type of research, various variable constructs are analyzed to understand interrelationships based on available data. The survey instrument used here was “an 18-item self-assessment questionnaire of Metacognitive processes of self-regulated learning (MPSL) to collect data” (Hladik & Hribackova, 2018, p. 173), created from two prior tools (Motivated Strategies for Learning Questionnaire and a Metacognitive Process Questionnaire). In this model, self-efficacy positively affects self-improvement, which has a significant impact on metacognitive regulation (self-evaluation, monitoring and planning) by predicting students’ monitoring directly and indirectly through planning and/or self-evaluation. Furthermore, self-efficacy positively affects self-evaluation, which has a significant impact on monitoring, directly and indirectly through planning (Hladik & Hribackova, 2018, p. 156). If there is one critique of this work, it is not clear that is meant by the “helping professions” aspect (except for the reference to health sciences) of the learners nor of the possible implications of conducting this research with this group of learners. These researchers suggest that self-regulation components may be proactive (purposeful) or defensive (“withholding the effort to maintain self-worth” (p. 191) or depressive (absence of SRL, disengagement). They suggest that any of these may be appropriate or inappropriate to the particular context and result in adaptive or maladaptive outcomes. For example, “Defensive self-regulation interferences may undermine successful adaptation through specific attributional patterns (e.g., unstable, external attributions of failure) or through task avoidance, cognitive disengagement, surface cognitive processing, self-handicapping and anxiety” (Loncaric & Peklaj, 2018, p. 188). Knowing what approach to apply depends on a more sophisticated sense of the context and what will result in the optimal outcome. There are times when SRL should be suppressed. It is not a net positive in all contexts. To understand some of these complexities, the authors create an integrative model which considers whether proactive or defensive SRL may be applied for academic achievement based on control beliefs, motivational beliefs, motivational strategies, and metacognitive strategies (Loncaric & Peklaj, 2018, p. 198). “Fail like you mean it!” goes a common meme. In some organizations, if one’s failure rate is just a few percentage points, that means that one’s goals are not sufficiently wild or audacious. Anyone who attempts something difficult and meaningful will experience failure, and that is all part of the learning. These social approaches align with Andrew A. Tawfik (University of Memphis) and Hui Rong (University of Massachusetts Medical School)’s “Self-Regulated Learning and Failure” (Ch. 8). In this work, the authors review various failure theories from various disciplines and how learners are advised to engage SRL to address these, and they propose a “unified failure model that attempts to reconcile the different terminologies and approaches to failure” (Tawfik & Rong, 2018, p. 212). Further, they review some learning technologies that “strategically employ failure to engender learning gains” (p. 212). Failure is part and parcel of new learning, which involves the hard work of accommodating new information to existing knowledge schemas per Piaget (1977, as cited in Tawfik & Rong, 2018, p. 217). They write: “Cognitive disequilibrium is important for failure-based and self-regulated learning in multiple ways. As learners encounter failure during the disequilibrium, they are able to iteratively refine their knowledge and close extant learning gaps. In doing so, they manage the process back to equilibrium” (Tawfik & Rong, 2018, pp. 217 - 218). There is “impasse-driven learning” (VanLehn, 1988), which occurs after an error is recognized, and this theoretical approach has a “special emphasis on the additional inquiry that the learner undertakes when a ‘fault-state’ is encountered” (Tawfik & Rong, 2018, p. 218). Case-based reasoning research focuses on ill-structured problem solving, which references back to past cases (and complex pattern recognition) to solve current challenges. Their unified model is illustrated as comprised of three circles: “success-based problem solving,” “failure-based problem solving,” and “mental model expansion & transfer.” In this visual, the mental model is informed by both successes and failures. The failures involve more analytical depth, involving the following steps: “assess viability of options, experienced failure, challenge existing mental model, inquiry, identify potential reasons, find evidence to validate reasons, identify root cause, new solution generation, implement proposed solution” in a cyclical process…that continues until satisfaction, and then the mental model is updated and reflected on for future transfer. (Tawfik & Rong, 2018, p. 223) The authors show how failure-based learning may be applied in game-based learning, case studies with hard problems, and other contexts. A person is responsible for developing his or her self to full potential, with the support of others, in challenging environments. In the self-regulated learning sense, people need the ego strength to face failure without a diminished sense of self, so they may approach the challenge with increased information and strategies and tactics. 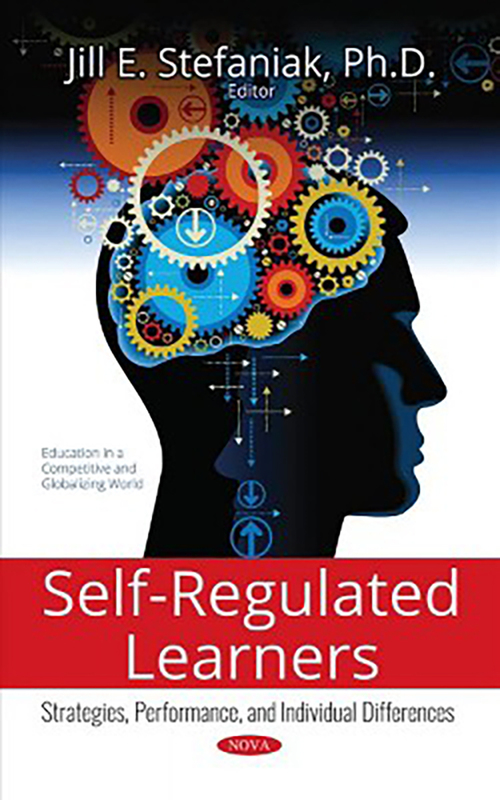 Dr. Jill E. Stefaniak’s Self-Regulated Learners (2018) is a highly readable and engaging collection of works by innovative researchers who have relevant insights about SRL. Shalin Hai-Jew works as an instructional designer at Kansas State University. She may be reached at shalin@k-state.edu. Note: Thanks to Nova Science Publishing, Inc. for a watermarked electronic review copy of this book. Discussion of "Book Review: Fostering Self-Regulated Learning from Childhood to Adulthood for Powerful Learning"
Version 4 id 2037040 of this page, updated 02 January 2019 by Shalin Hai-Jew. Created by Shalin Hai-Jew. C2C Digital Magazine (Fall 2018 / Winter 2019) by Colleague 2 Colleague. Help reading this book.